The morning began as a wet, drizzly, raw November day but once the various teams arrived from almost every neighborhood in Malden, the day took on a remarkable change. The grey mist turned into a parade of bright and colorful hockey jerseys worn by old-school buddies coming together to remember a friend and play some old fashion street hockey for a good cause. 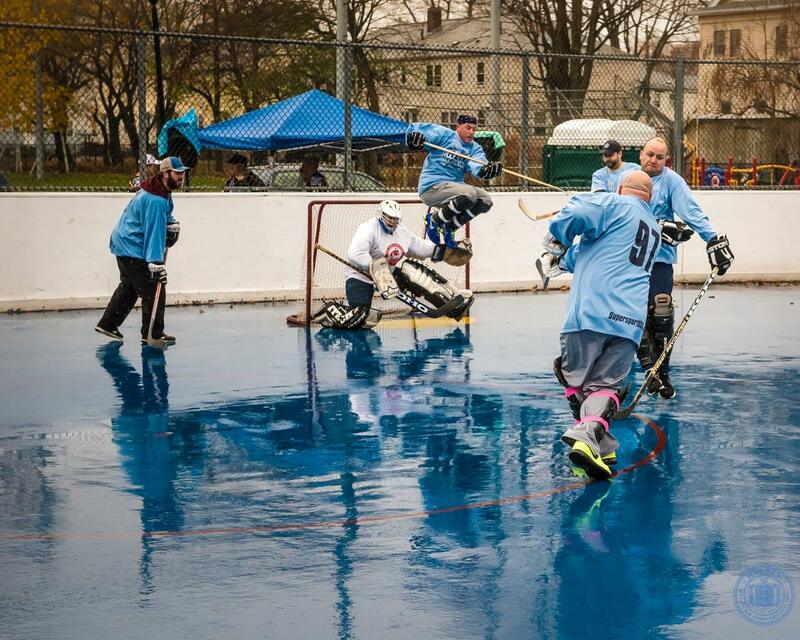 It was the fourth time the annual “Home for the Holidays Street Hockey Tournament” was being held and this year, according to one of the organizers Chris Rosa, what started out as a small group of pals playing some pickup games turned into a 10-team tournament that raised over $4,000. The money is going to the Malden/East Boston Youth Hockey organization and this year the event honored the memory of Joe Vaitkevicious aka ”Bones,” who just a few months ago at the age of 41, lost his life to cancer. 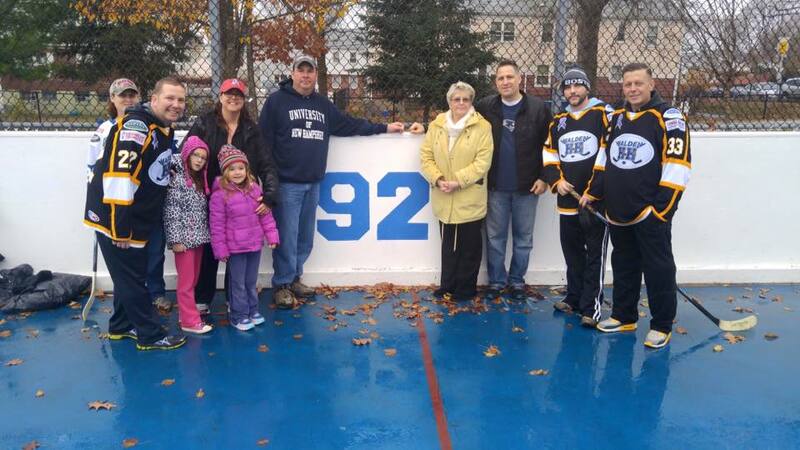 His old hockey number “92” was painted on the boards of the rink located outside the Linden School. 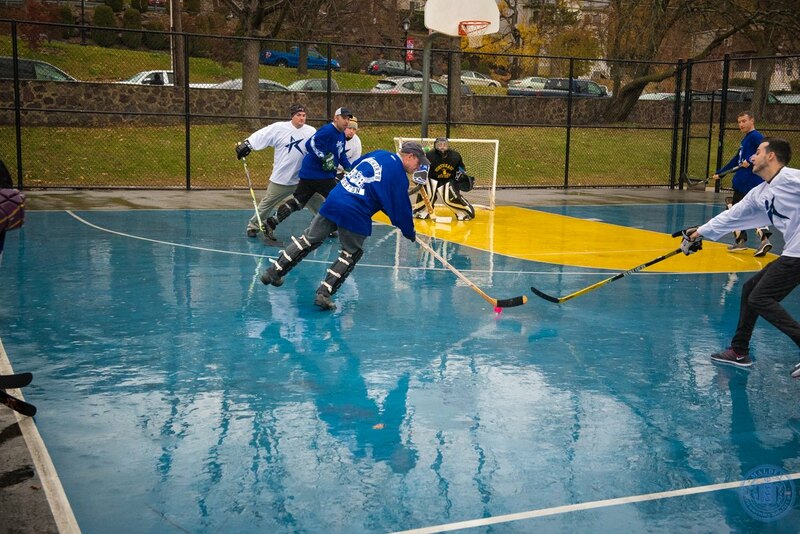 The rain made the rink look like ice and the players seem to be skating as they battled for the little red ball with their hockey sticks splashing around on the slippery wet surface. There were several spills and a few wipe outs on the rink but the enthusiastic spirit of the participants kept the games lively and full of fun. I watched each player come off the boards after playing for five or eight minutes some of them gasping for breath then anxiously waiting to get back in to make that goal and win the game even if they ended up hydroplaning into the net. Several of the players had moved out of Malden over the years but came back home to be part of this event. Some from as far away as Florida and Joe’s own mother, Pat Gibbons, who was there to watch the tribute, came up from North Carolina. It was like a reunion of old acquaintances getting back together for the holidays reliving old times and sharing the game they loved so much in their youth and to show their own kids how it was done. Each of the teams—many of them named after the various streets and neighborhood squares around Malden—played a series of three games of 20 minutes each. Eventually, after surviving an elimination playoff, the tournament title went to the “Judson Square” team as well as the bragging rights for next year. Video: View highlights from the big game! Great story and what an action shot!